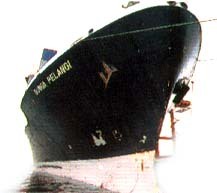 Malaysia International Shipping Corporation Berhad (MISC) is the leading national shipping line of Malaysia. It is listed on the Main Board of the Kuala Lumpur Stock Exchange with the largest shareholder being Petroliam Nasional Berhad (PETRONAS), the national oil conglomerate of Malaysia with 62.08 % equity. The principal business of the Corporation consist of ship-operating and other activities related to shipping. With a modern and well-diversified fleet of 125 vessels and a combined tonnage of more than 4.6 million DWT, MISC provides reliable, efficient and competitive shipping services both locally and internationally. Its vessels are manned by experienced shipping professionals using the latest information and logistics systems. MISC is a specialist in the carriage of LNG . 13 LNG carriers,10 with a lifting capacity of 130,000 cubic metres of LNG, shuttle between the gas fields in Sarawak to Japan to serve a long term charter with Malaysia LNG. In the liquid bulk trade, MISC is a large carrier of vegetable oils from South East Asia, including palm oil from Malaysia which is the major component in this trade. Its fleet of 15 chemical and parcel tankers of between 8,000-32,000 DWT is incorporated with the latest containment and handling systems to ensure a safe and efficient carriage of liquid parcels including chemicals. MISC's 9 crude oil and 6 product petroleum tankers of between 6,000-110,000 DWT each carry crude oil, unleaded gasoline (ULG), gas oils and jet fuel. The crude oil tankers operate in international waters covering the region east of Suez up to and inclusive of Japan-Korea-Australia-New Zealand range. The product tankers are generally deployed in the Asean regional waters. Of the 3 MISC's liquified Petroleum gas carriers, 2 are on time charter and operate within Malaysian waters whilst the other is on spot charter worldwide. The Corporation's varied fleet of 52 bulk carriers consist of 11 panamaxes, 40 handymaxes and 1 multipurpose bulk carriers. These are engaged in worldwide cross trading on voyage or time charters carrying grain, wood chip, coal, ores, fertilizers, steel and forestry products. MISC also provides liner services through its 27 container ships which call regularly at ports in Europe, Mediterranean, South Africa, Gulf,Australia, New Zealand, East Asia and South East Asia. Punctuality and fast transit are the key words of operations, with MISC's scheduled frequencies skewed to the specific needs of the individuals trades. With this in mind, MISC has teamed up with several other international lines under certain strategic alliances in various trade routes to provide efficient and competitive services to its customers worldwide. With its recent acquisition of 100% stake in Petronas Tankers Sdn Bhd and PNSL Ltd (formerly known as Pacific Basin Bulk Shipping Ltd) as well as the shipping assets of PNSL Berhad and its 51%stake in Asia LNG Transport Sdn Bhd and Asia LNG Transport Dua Sdn Bhd, MISC is set to be a major player in the global industry. Apart from attaining dominant status in the rationalisation of the nation's LNG carriage services, MISC has also emerged as the leading LNG and dry bulk player in the region. These acquisition has enabled MISC, as the country's leading ship owner, to achieve the strategic critical mass and place it in a better position to complete with other international shipping companies.